An in-depth look at the PlayStation VR title. The PlayStation Blog has gone up with 14 minutes of gameplay from the upcoming PlayStation VR title Moss. Meet Quill, a young mouse with dreams of greatness beyond the confines of her quiet forest settlement. One day while exploring the woods, she finds a mysterious Glass Relic and an ancient magic is awakened. Dramatic events quickly unfold as a distant evil extends its reach. With her uncle now in grave danger, Quill must embark on an epic journey—and she needs you there by her side. Together, you’ll travel to forgotten realms, solve challenging puzzles, and battle menacing enemies. Alone, no one can conquer what you’re up against. But united, you just may defeat even the darkest of villains. Immerse yourself in the world of Moss to help write the story of a hero in the making. Physically Interact in a Dynamic World – Reach into an interactive, tactile world where your every action has meaningful impact. Move objects, heal allies, and alter the very landscape of battle through your own direct influence. Travel to Fantastic Places – Your senses will transport you to expansive environments brimming with beguiling creatures. Explore every cave and corner, from idyllic forests to foreboding ruins. Admire the vast, panoramic views in a lively world that hums with wonder. Form a Unique Bond – Welcome to an alliance for the ages. Through mutual communication and shared experience, your relationship with Quill deepens and thrives. Your abilities are complementary to hers–every victory belongs to you both. Learn the Story of Moss – From its opening pages, Moss will draw you in to a world of myth and magic. Enjoy a rich tale of intriguing characters, illustrious artifacts, and legends old and new. Classic Controls with a Twist – Guide the hero via approachable and familiar action-adventure controls. At the same time, you’ll directly manipulate the field of play as your own character and key ally to Quill. 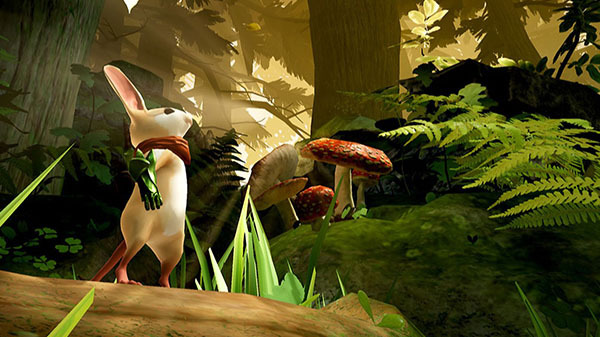 Moss is due out for PlayStation VR via the PlayStation Store sometime this month.